Hello and Welcome to SMART DOGS‘ blog, where Dogs are beloved Friends, Family Members and Teachers! Whether you already know us from SMART DOGS facebook page, our Plumwood Posse youtube channel, taking Classes at SMART DOGS Training Center, or are meeting us for the first time, we hope our blog helps you Think, Learn, and Grow. We also hope it helps you understand and use positive reinforcement and two-way communication to build strong, healthy relationships. Our blog emphasizes Learning, Behavior and Health – learning about yourself as you learn about your dog, with your dog, and from your dog; understanding behavior and how to change it (yours and your dog’s); improving physical health, emotional health and behavioral health. While we include posts on Dogs and Dog Training, posts on Human Behavior, “People Training” and Life in general are also included. As part of our mission to help you and your dog live a Happy, Healthy, Productive Life, we’ll share information on “Life in the SMART Zone”* – what it is and how to achieve it. The page called “Daily Dose of Dog” has growing galleries of our dog photos to brighten your day. New photos added weekly. For now, a brief introduction to who we are. My dogs are the Plumwood Posse,** and they bring inspiration, delight, laughter, friendship, lessons and knowledge each and every day. Shown L to R in the photo below: Chibi-chan, Penelope, GingerPeach, Geronimo***, Rocky and Piglet. I am a full-time Certified Professional Dog Trainer, and the owner of SMART DOGS Dog Training located in Van Buren, Arkansas. See this link for more About Me. We look forward to hearing from you and sharing with you and your dog! Thanks for visiting. * “Life in the SMART Zone” is the working title of my upcoming book. More information coming soon. 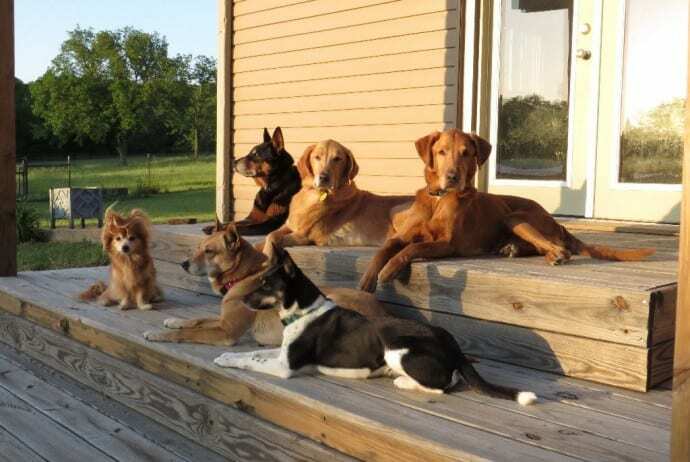 **Each of the Posse dogs was found abandoned and in a state of neglect, but they now live in the SMART Zone and are happy, healthy, confident superstar dogs! ***Sadly, Geronimo went to the Rainbow Bridge on June 03, 2013, he was was 11.5 years young, and a most special friend and teacher. We miss him dearly.